Here it is, January again, with resolutions and intentions abounding. I am not different from others in that I like to use the new year as a time for new beginnings. I also like to look back at the past year, and it is always with some amazement. I have traveled more this year than I think I ever have, and in doing so discovered how big and how small the world is. Big in that there are so many beautiful places to see and small in that it is so easy to hop on an airplane and go hundreds of miles in just a few hours. That is amazing to me. I went to Iowa, Montana, Wyoming, New York, Massachusetts, Vermont, New Hampshire, Maine, Nova Scotia, and North Carolina! I made a few short weekend excursions, finishing up 2015 and beginning 2016 in a one room cottage near New Ulm, Texas. I had purposed after attending a New Year’s Eve party last year that this year would be out in the country, stargazing. The cloud cover unfortunately prevented that, but it was still lovely. The cottage was warm and cozy, the houses and people were few and far between, the sky was big, the walks were long. 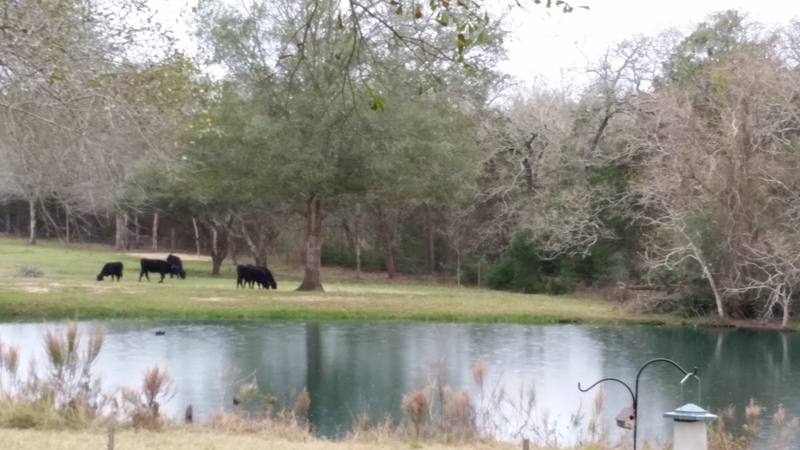 The house next to the cottage had a great porch we were invited to sit on, and I enjoyed my coffee there both mornings, looking over a pond and communing with the neighboring cows. It was all very head clearing. The other big thing for 2015 was my decision to study Ayurveda, and I have completed two of the three terms in the course of study through New World Ayurveda. I love the subject material and already have been able to apply what I’ve learned to my own life as well as sharing some of my new knowledge with a few others who have shown interest. My hope is to be able to establish a practice and be able to truly help others find health and well being for a better quality of life. On New Year’s Eve, we made a big deal of leaving behind old outdated ways of thinking that no longer serve us well. The biggest thing for me, and surprisingly hardest, was to leave behind, for good, “I can’t”! I do alot of stuff, but I was constantly second guessing myself, doubting my abilities, telling myself I’m too old, etc. No more! I can, and I will. For 2016, my main intention is to have more compassion, wherever I go, and with whomever I meet. Looking forward, I see another beautiful blank slate, with shadows just beginning to take shape on the canvas. I anticipate continuing my studies, with two trips to new places for hands on intensives. I look beyond completion of this course to possibly deepening and continuing in the fall. I had thought a year ago that I would stop my day job in June, but now I see myself continuing on for another couple of years at least. I look forward to more reconnecting with my grown kids, more time with my growing granddaughter, more music, more long walks, more yoga, more coffee, more good books, more love, more compassion.